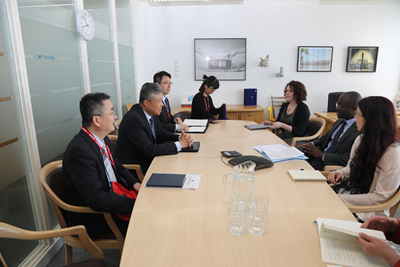 On May 22, Ambassador Liu Xiaoming met with Sam Gyimah MP, UK Minister of State for Universities, Science, Research and Innovation. 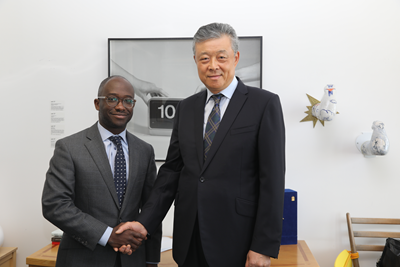 Ambassador Liu extended his congratulations to Minister Gyimah on assuming the new post and noted that China-UK “Golden Era” has been developing rapidly, with ever-deepening exchanges and cooperation in all fields. Earlier this year, Prime Minister May paid a successful visit to China. During the visit, the leaders of the two countries agreed to build a more strategic, practical, global and inclusive China-UK relations. Education and innovation are the major fields in China-UK cooperation. There are currently 170,000 Chinese students in Britain. The UK has more Confucius Institutes and Confucius Classrooms than any other European countries. Last December, China and the UK signed The China-UK Joint Strategy for Science, Technology and Innovation Cooperation, building a new platform for their cooperation on science, technology and innovation. The Ambassador expressed the hope that the two sides could stay open to each other in the future to deliver more “golden fruits” in the above fields. Gyimah said that the UK attaches great importance to China-UK cooperation on higher education, science, technology and innovation. Britain will optimize its service in higher learning to attract more Chinese students to the UK, while encouraging and supporting more British students to study in China. He hoped that the two sides could make full use of The China-UK Joint Strategy for Science, Technology and Innovation Cooperation and other exchange mechanisms to take the cooperation on education and innovation between the two countries to a new level. Other topics discussed at the meeting are education development planning, the international mobility of students, the exchanges of young scientists, IPR cooperation and UK visas for Chinese students.